Co2 jets are a staple in most big productions & ForceFX CO2 Jets have an impressive 8m plume which are available for hire & to purchase as kits. CO2 jets are a staple in most big productions & festivals these days as a way of providing safe spectacular visual effects that add noise and excitement to all kinds of shows and events. CO2 Jets are particularly suitable for night clubs and DJ's. CO2 jets are electronically operated units that create cryogenic fog plumes of approximately 8m high with a loud sizzling sound, which makes the effect even more spectacular. Unlike a fog effect the CO2 plume dissipates almost instantly after the valve shuts off. They can be mounted on any flat surface, or clamped to a lighting truss or upright to produce angled jets across your stage set or onto a dance floor. Versatile and safe CO2 Jets are a great effect in their own right. 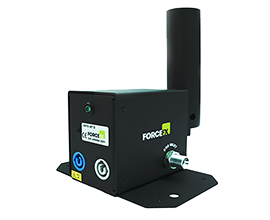 At ForceFX we manufacture our own brand of CO2 Jets called the Cyro Jet II here in the UK using UK and European parts to ensure quality for our customers both on hire and for permanent CO2 installs. Because we use the jets out on events ourselves and our customers hire them we have designed our CO2 Special Effects for our users to ensure we can provide the best effect offering various power options and custom hosing & connectors to enable our CO2 Jets to be used worldwide. We pride ourselves on our customer service offering a 3 year warranty on all sales with the first year with next working day advance replacement if you have any issues.